In the 4+ years that I’ve been selling on Poshmark, I can recall two previous times where I had to deal with a return. The first return was during my initial months of selling. During this time, you were only limited to 4 photos a listing. I thought that I had described my item as best as I could, and indicated pictures of the flaws. It turns out, the buyer said that there was more wear than I had shown. I tried to fight it, but Poshmark sided with the buyer. Luckily for me, this buyer was an honest Posher, and she had returned the bag in the same condition. She even sent a note explaining her side and advised she still believed that I was a great seller. My second return was my own fault. It happened two years later. The buyer purchased a blazer, but found it was a 3/4 Sleeve. I never mentioned that detail in my listing. She wanted a full length. I admitted fault and asked Posh to expedite the return. The buyer again was an honest Posher, and she returned the blazer quickly and in the same condition that I sent it. I was able to resell it to another buyer, who had no complaints. Until now, those were the extent of my returns experiences. No issues, honest buyers, and an easy transaction. This past month, I had my first return in years. It was a bit of a frustrating experience. I had received an email from Poshmark stating that a case had been opened because the buyer stated that an item was “broken, damaged or stained.” They mentioned the policy of asking the buyer to describe the issue and sending photos. They also stated that if I wanted to send feedback, I could do so through the app. I was a bit annoyed. Of course, I had planned to send feedback. However, how could I do so if I didn’t know which of her bundled items had the issue? How could I know what to refute if I had no details about her compliant ? It was a flawed, generic email. A few days later, I received an email from support again, stating that they had approved the return. I was shocked. They mentioned that the buyer claimed “additional wear” and attached photos, which I finally had access to. At this point, I was confused. Why did they approve the return without giving me enough details or photos to even refute it? I responded and asked for details. They finally gave me the photos and said the buyer indicated “more wear than described”. This buyer bought a bundle, and the shirt she stated was the issue was nearly free of charge after the discount. Her claim indicated severe tears at the neckline, which were not shown or described. I was surprised. I would have never sold any items in that condition. The type of tears she indicated were very obvious, so there was no way that it could have been overlooked. Yet, Poshmark approved her return request. I was appalled. How could it be approved ? I had sent in my rebuttal, but only after I had to request from Support as to why the return was being approved. It wasn’t right. When I responded with my own photos to compare and advise that my items were actually without wear, I was told to wait for the returned package. When it finally came, I was shocked. The shirt was torn in such a way that it had to be discarded. It had odors. The other top was there, but it also had odors. The third item in the bundle was missing, and in its place was a sweater that did not belong to me. It too has a worn odor. I immediately alerted Poshmark via the app and in response to the support email. I included my photos again, along with photos of the top that wasn’t mine. I reiterated that the items not in the same condition that I sent, there were evidence of wear (odor), and I received a top that wasn’t sold in my closet (my original top still with the buyer). After some time, I finally received an email from support. They stated it was hard to tell who was at fault, and many things are overlooked by users. Because they valued me as a user, they gave me my earnings. Before that email, I had received a satisfaction survey from Poshmark. That seemed premature. How could I have rated them if the case was still open? Needless to say, once the case was officially closed, I ranked the process as not satisfactory. I believe the returns process remains flawed. Both buyers and sellers need to be treated equally. We as sellers should have a right to know (via Support) what the buyer’s claim is before a decision is made. We should receive details with photos instead of a generalized email. Once proof from the buyer is provided, the seller should be given time to review the claim before the decision has been made. We should be given the opportunity to issue our agreement or provide disagreement with an accompanying statement. I can see the difficulty in finding the responsible party in cases like this. However, like many sellers, I feel that it heavily supports the buyer. I agree that buyers need security when purchasing online, but not to the extent where they can receive refunds for vague or little details to the seller. Overall, though I’m dissatisfied with the process, it has not deterred me from selling. I have made a decent number of sales since that return. Every single buyer was pleased and did not file a return request. My buyer satisfaction ratio is still quite high. 3 returns total, 2 of which were “damage” cases. After all this time, it is still a great rate. Furthermore, it doesn’t change my selling and listing strategies. I will continue to take detailed photos and write descriptions. I won’t let one bad transaction ruin an otherwise positive experience. The cancellation doesn’t appear to potential buyers. Once the transaction was closed, I blocked the buyer and never looked back. There’s no sense in allowing someone like that impact my success. 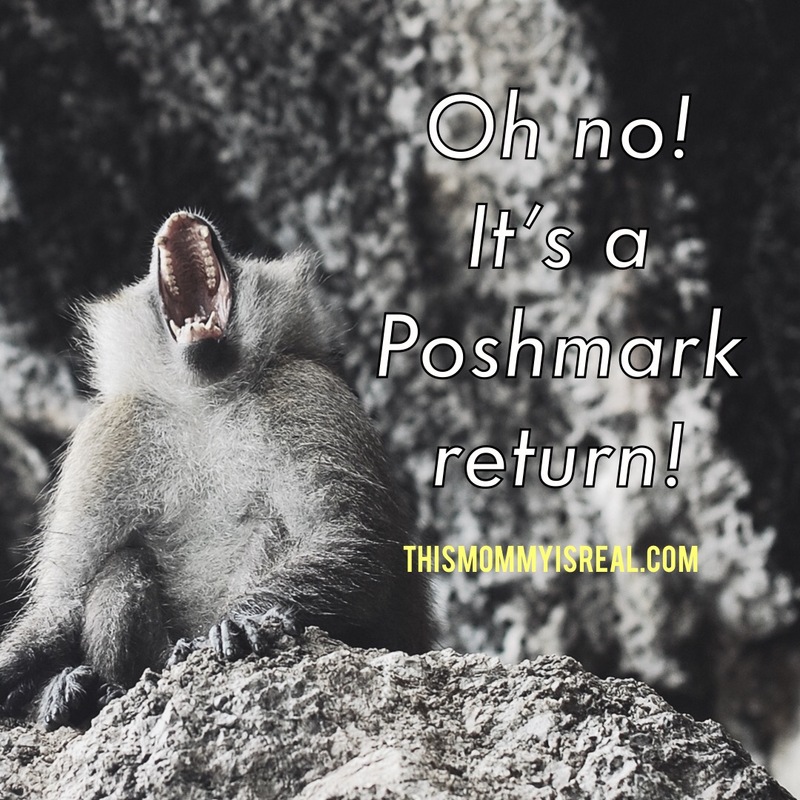 What are your experiences with the Poshmark return process? Bought a pair of shoes. No bargaining – paid seller’s price. No they didn’t – they fit like a 9.5. Sent pics showing 1/2″ gap at heel. This is the real problem w/ selling on Poshmark. Poshmark sided w/ seller – told me to open a Poshmark account and sell shoes. Did that and have been selling for abt 6 mos now – no problems – suddenly I have a rash of returns in last month and Poshmark is siding with buyers.